Join us Saturday, April 22, 10 AM to 9 PM, for our biggest sale of the year! 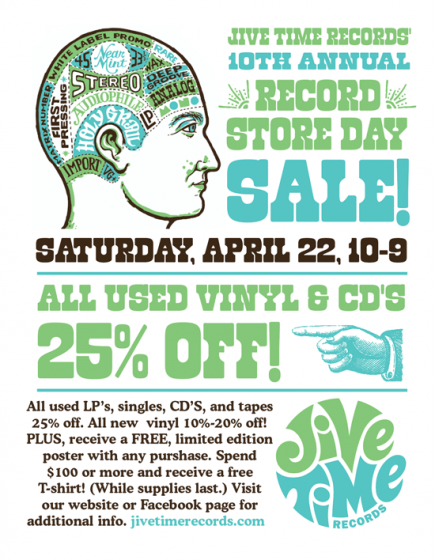 In celebration of national Record Store Day, all used records and CD’s will be 25% off! (Additionally, all new vinyl will be 10% – 20 off!) Plus, receive a FREE limited-edition, hand-screened poster with any purchase. Spend $100 or more and get free T-shirt! (While supplies last). Thank you for supporting Jive Time and all of our local, independently-owned record stores on Record Store Day and every day. Brick and mortar (and vinyl) is alive and well in Seattle!